The newly formed 6-members boyband “U-Kiss” ( which stands for U-Korea Idol Super Star) will debuting under the label-company NH Media. The boys will debut in Japan on the 15th of August at the POWER OF ATAMIX with SS501 and PARAN. Later on they will make their first performance in Korea on M!NET MCOUNTDOWN with their new single ‘Not Young’ on the 28th of August. Noticeable members in the group are Kevin Woo and Kim Kibum who used in Xing. The four other members names are Eli, Alexander, Shin Dong Ho and Shin Soo Hyun. We wish you boys the best of luck in the future and we truly hope that Kevin will dye his hair blonde again! hope this time you’re group would be really a super-star!! be popular and foremost,be successful! kibum your hair from the airport!! it’s like from your bro’s!! and sunghyun!! you hair/style too it changed!!!! why kevin and marumir stoped from XING??? If I remember it correctly, Xing still exist and the current members are; ZEN, Yoon, Husky, White, Gun and Kipalang (Jeon Ji Hwan <3). Kevin quit in 2008 and Marumir quit already in 2007, both for the reason of a better future. I’m not sure though – iRapeHellokitty. me and my friends love your new single……. wish you all the best……..
and also congrats to your success……..
hope that you and your bandmates can visit here at the Philippines……. i hope that we can meet personally…. l0ve u U-KISS…..U-KISS, aza aza fighting…. 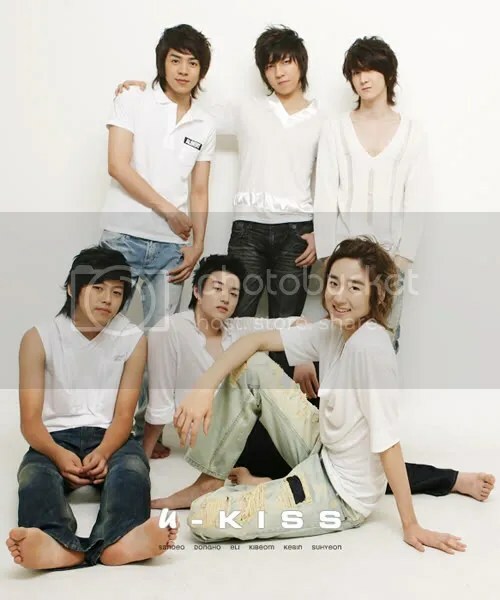 kevin you so cute i like your smile love you…..
why all of you is cute all so kevin and eli ..
yo ba se yo u kiss…..
Wow they debut on my sweet “14” birthday.. watta present.. lol.. Love U-kiss!!! hi ukiss..how are u all of u was so hand some and a good singer,, take care always..
UBIQUITOUS Korean International (Idol) Super Stars. U-KISS, YOU ARE THE BEST!!! FIGHTING!!! HOPE YOU’LL MAKE A DAEBAK SOON!!! l Luv U-KISS 4 ever!!!!!! How the band has developed and grown over the years. And I am even more pleased to know that debuted in Korea on my birthdae Aug 28th!!! And watched Eli, Kevin and Alex on Popsin Seoul….how far the boys have come. All the best UKISS. You guys ROCK! !